"Veldt" redirects here. For other uses, see Veldt (disambiguation). Veld (/vɛlt/ or /fɛlt/), also spelled veldt, is a type of wide open rural landscape in Southern Africa. Particularly, it is a flat area covered in grass or low scrub, especially in the countries of South Africa, Lesotho, Swaziland, Zimbabwe and Botswana. A certain sub-tropical woodland ecoregion of Southern Africa has been officially defined as the Bushveld by the World Wide Fund for Nature. Trees are found only in a few places—frost, fire and grazing animals allow grass to grow but prevent the growth of trees. The word veld (Afrikaans pronunciation: [fɛlt]) comes from the Afrikaans word for "field". The etymological origin is older modern Dutch veldt, a spelling that the Dutch abandoned in favour of veld during the 19th century, decades before the first Afrikaans dictionary. A cognate to the English field, it was spelt velt in Middle Dutch and felt in Old Dutch. The climate of the veld is highly variable, but its general pattern is mild winters from May to September and hot or very hot summers from November to March, with moderate or considerable variations in daily temperatures and abundant sunshine. Precipitation mostly occurs in the summer months in the form of high-energy thunderstorms. Over most of the South African Highveld, the average annual rainfall is between 500–900 millimetres (20–35 in) a year, decreasing to about 250 millimetres (9.8 in) near the western border and increasing to nearly 1,000 millimetres (39 in) in some parts of the Lesotho Highlands; the South African Lowveld generally receives more precipitation than the Highveld. Temperature is closely related to elevation. In general, the mean July (winter) temperatures range between 7 °C (45 °F) in the Lesotho Highlands and 16 °C (61 °F) in the Lowveld. January (summer) temperatures range between 18 °C (64 °F) and 30 °C (86 °F). In Zimbabwe the precipitation averages around 750–900 millimetres (30–35 in) on the Highveld, dropping to less than 350 millimetres (14 in) in the lowest areas of the Lowveld. Temperatures are slightly higher than in South Africa. Over the entire veld, seasonal and annual average rainfall variations of up to 40 percent are common. Damaging drought affects at least half the area about once every three or four years; it reduces plant and animal biomass to sustainable levels again. Everywhere the average number of hours of annual sunshine varies from 60 to 80 percent of the total amount possible. Veld can be loosely compared to the Australian terms outback or "the bush", to the prairie of North America, to the pampas lowlands of South America, or to the steppe of Central Asia. Someone from Yorkshire might equate "wandering across the moors" to "walking through the veld." By extension, the veld can be compared to the "boondocks" or those places "beyond the black stump" in Australia. There is a sense in which it refers in essence to unimproved land (and is therefore not the equivalent of the English paddock) and does not include areas used both for pastoral activities and the planting of crops. These areas are referred to as fields. The word is less appropriate for land that is heavily forested, mountainous, or urban. The simplest explanation will be to say the word "veld" means "natural vegetation"; excluding vegetation like swamps and forests. It does include mountains with vegetation but not deserts or mountains without natural vegetation. The veld definition may encompass different natural environments, both humid and dry, such as Coastal plain, Coastal prairie, Flooded grasslands and savannas, Grassland, Prairie, Savanna, Steppe, Meadow, Water-meadow, Flood-meadow, Wet meadow, as well as agricultural fields. Whereas mountainous peaks and thick forests do not really fit in with the term veld, bushes are acceptable. The area then becomes Bosveld, a term that is used mainly to describe Die Bosveld ("The Bushveld"), which is both a loose botanical classification and a specific geographical part of what used to be known as the Transvaal, as described for example in the story Jock of the Bushveld. The word Renosterveld, "rhinoceros-field", is now used to differentiate one of the major vegetation types of the Cape Floristic Region. A carefully husbanded sports field on which the game of Rugby is played in the middle of cities such as Cape Town or Johannesburg is referred to as a "rugbyveld" in the Afrikaans language. The word "veld" also carries military connotations. The word "field" in English has a strong association with "war", as evidenced by the expression "the first foe in the field" and the lines of the ballad 'Lord Marlborough' (see John Churchill): "You generals all and champions bold, that takes delight in field, that knocks down churches and castle walls but now to death must yield". The same relationship is paralleled in Afrikaans. Just as the English Army has its Field Marshals, the Boer armies had their Veldkornets and Veldkommandos. A map of South Africa showing the Great Escarpment and its relation to the Highveld, Lowveld and Lesotho Highlands. The portion of the Great Escarpment that is colored red is known as the Drakensberg. It forms the only well defined boundary of the Lesotho Highlands and the Low- and Highveld. The west- and southward extents of all three of these areas are arbitrary. The term "Lowveld" is used only in South Africa, Botswana and Zimbabwe. Thus, although the Lowveld is continuous with Mozambique's coastal plain, the term "Lowveld" is not used there, hence it is shown in orange, as opposed to the yellow in the other southern African countries. The term "Lowveld" is also not applied to other low-lying areas in South Africa, Botswana or Zimbabwe. Much of the interior of Southern Africa consists of a high plateau, the higher portions 1,500–2,100 m (4,900–6,900 ft) of which are known as the Highveld, starting at the Drakensberg escarpment, 220 km (140 mi) to the east of Johannesburg and sloping gradually downwards to the west and south west, as well as to the north, through the Bushveld towards the Limpopo river. These higher, cooler areas (generally more than 1,500 metres or 4,900 feet above sea level) are characterised by flat or gently undulating terrain, vast grasslands and a modified tropical or subtropical climate. To the east, the Highveld's border is marked by the Great Escarpment, or the Mpumalanga Drakensberg, but in the other directions the boundary is not obvious and often arbitrary. The blesbok and quagga were among the large animals that once roamed on the highveld in great numbers. Nowadays there still is a sizeable population of springbok in some areas, though much of the area is devoted to commercial farming and South Africa's largest conurbation (Gauteng Province). The lowlands, below about 500 m (1,640 ft) altitude, along South Africa's northern border with Botswana and Zimbabwe, where a 180-million-year-old failed rift valley cuts into Southern Africa's central plateau and locally obliterates the Great Escarpment, is known as the Lowveld. The Limpopo and Save rivers run from the central African highlands via the Lowveld into the Indian Ocean to the east. The Limpopo Lowveld extends southwards, east of the Drakensberg escarpment through Mpumalanga Province and ultimately into eastern Swaziland. This southern limb of the Lowveld is bounded by South Africa's border with Mozambique to the east and the north-eastern part of the Drakensberg to the west. This region is generally hotter and less intensely cultivated than the Highveld. Trees and bushes: Genus Acacia and Rhus, such as Acacia caffra, Acacia sieberiana and Rhus pentheri and other species like Ziziphus mucronata, Ehretia rigida and Cussonia spicata. Sandveld, in the general sense of the word, is a type of veld characterised by dry, sandy soil, typical of certain areas of the Southern African region. It usually absorbs all water from the seasonal rains, although aquatic habitats, largely seasonal, may be also found in specific places in the sandveld. Only certain hardy plant species thrive in the sandveld environment. These consist especially of grasses forming clumps and certain kinds of trees and shrubs. The sandveld vegetation has a particular pattern of growth, rarely covering the whole terrain and thus leaving patches of sandy soil exposed on the surface. Some of the typical sandveld species are Acacia haematoxylon, A. luederitzii, Boscia albitrunca, Terminalia sericea, Lonchocarpus nelsii, Bauhinia petersiana and Baphia massaiensis. Hardveld is a term applied to certain areas of rocky soils in Botswana, located mostly in the eastern part of the country. The landscape is an undulating plain with scattered rocky hill ranges. There are areas of hardveld also in South Africa in the mountainous central Kamiesberg of the Northern Cape with hilly escarpments and deep river valleys. The soil of the hardveld is characterised by rocky outcrops, as well as an abundance of stones and pebbles of different shapes and sizes. 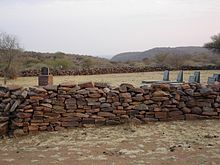 The flora of the hardveld is typical of rocky savanna, with denser vegetation and thus less denuded patches than in the sandveld, as well as taller trees. There is also a higher diversity of species in the hardveld compared with the sandveld. Peltophorum africanum, Acacia nigrescens, A. tortilis, Combretum apiculatum and Colophospermum mopane are some of the representative species of the northern hardveld. ^ "Southern Africa bushveld". Terrestrial Ecoregions. World Wildlife Fund. ^ McCarthy t. & Rubidge B. (2005) The Story of Earth & Life. p. 246-247. Struik Publishers, Cape Town. ^ McCarthy, T.S. (2013) The Okavango delta and its place in the geomorphological evolution of southern Africa. South African Journal of Geology 116: 1-54. ^ "Thorn Veld Ecozone – Kruger National Park". Ecotravel.co.za. Archived from the original on 11 May 2012. Retrieved 31 October 2012. ^ "KwaZulu-Natal Department of Agriculture – Mixed Thornveld Ecozone". Agriculture.kzntl.gov.za. Archived from the original on 1 July 2012. Retrieved 31 October 2012. ^ "Thamnochortus bachmannii". Plantzafrica.com. Retrieved 31 October 2012. ^ "FAO Country Pasture/Forage Resource Profiles – Botswana". Fao.org. Archived from the original on 15 September 2012. Retrieved 31 October 2012. Look up veld in Wiktionary, the free dictionary.